When Charles S. Stratton was born in 1838, he was a large baby, perfect in every way. But then he stopped growing. At age four, though a happy and mischievous child, he was just over two feet tall and weighed only fifteen pounds—the exact same size he had been as a seven-month-old baby. It was then that the notorious showman P.T. Barnum dubbed him Tom Thumb and put him on display, touring him around the world as a curiosity. A natural performer, Charley became enormously popular and wealthy, more so than any other performer before him. 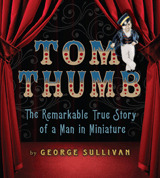 In this spirited biography—the first on its subject—George Sullivan recounts the fascinating adventures of Tom Thumb, and raises challenging questions about what constitutes exploitation—both in the 19th century and today. This book really caught me by surprise....the story of a miniature boy who became one of the most famous persons of his time in the mid 1800s. If you love history, or maybe you are into the fascinating world of P.T. Barnum - for me I love stories about the abnormalities of America. This story will captivate you and keep you intrigued all the way. I have to say that it kept me reading all night for several evenings, simply because the world that Charley S. Stratton lived was quite intriguing. At the young age of 3 years old, this young American from Connecticut was discovered and started to perform in slide shows (although he was showcased as being an 11 year old British boy) along with other "freaks" like Siamese twins, the bearded lady and other such humans who were so-called "abnormal". I remember every year I would always attend the local festivals/fairs and they would always have the booths where you paid 50 cents or $1.00 to see such things as "The Miniature Woman" or "The Snake Man". I don't know what it is that fascinated me so, or even other onlookers...but I suppose there has always been an audience for the weird or strange phenomena that cannot be explained. I am not sure if these types of things still exist, maybe they do...but this book really tells the background of such shows. It not only shares the "exploited life" of 'Tom Thumb' but it also tells the background of P.T. Barnum and how his career started as well. I would recommend this book to anyone middle school age or older, simply because it is a little bit of a mature book. There is no bad language or risky pics (which by the way there a tons of pictures - which I loved!). But the actual way that this young boy was brought up, seems to be very mature at such a young age. I could not imagine being his mother and letting my child be on display or putting on shows - traveling the world and being somewhat "exploited". I love how so many famous people, including Queen Victoria was "humbugged"...You will just have to read the book to find out what that means! I would rate this book 5/5 stars for sure! To learn more about the book click here. This book will be available to purchase on Amazon (on April 11, 2011). Thank You so much Net Galley and Houghton Mifflin Harcourt for allowing me to read this book! I cannot wait to read more books from you in the future!